5 Increased Home Security Measures You Should Take Before Bringing Home A New Baby | Calgary Alarm Inc. There are various security measures and provisions that should be in place regardless of who lives in your home. There are also certain measures that should and need to be adopted when you live with family members that are vulnerable, even helpless, and this is exemplified in newborn babies. Although your whole family needs to be safe, there are additional security measures you should take before coming home from the hospital after birth. Place motion detectors in the nursery. 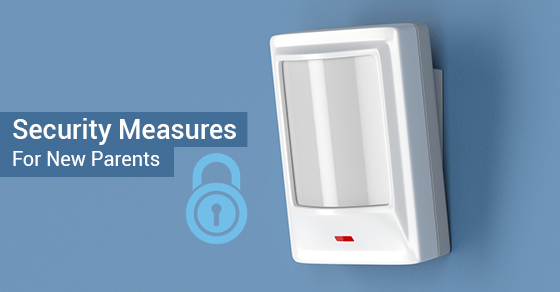 If you already have motion detectors installed in your home, you should consider investing in some extra ones you can place in and around the nursery where the baby will sleep. The thought of an intruder breaking into your home and either going straight for or stumbling upon the baby’s room is a very uncomfortable one. Having motion sensors in the room that can sound the alarm when activated is good peace of mind to have. Baby monitors are a good start, but video surveillance will allow you to remain vigilant when you inevitably have to duck out of the house to take out garbage, collect the newspaper, or even when you are running to and fro inside the house, video surveillance will greatly reduce your anxiety. Install window locks and guards. Firstly, to keep the baby in. As infants begin to develop their coordination and motor skills, they will be grasping, twisting and turning anything they can get their hands on. A baby on the loose is a baby in danger. Secondly, and the more pressing concern, is keeping intruders out. Ensure smoke detectors are in full working order. Regular smoke detector testing is something that everyone should do, regardless of who they are living with. This holds all the more true when there is a new life you have brought into the world that needs protection! Fires happen, and knowing that you have functioning smoke detectors installed that will warn you, giving you time to take action and avoid a tragedy is invaluable. Being able to monitor your home from your phone while you are in another room is an enormous added benefit of today’s integrated, wireless home security systems. The less time your baby is out of sight or earshot the better, and the easier it is for you to achieve that, the better. There are a lot of preparations that go into bring home a newborn child. You’re going to spend 9 months making sure everything is in order for the arrival of the new family member, so don’t forget to consider the very important home security measures you may need to rethink or put into place when planning and executing everything.